The What: Just in time for DSE 2019, Peerless-AV has introduced the second generation of its All-in-One Kiosk powered by BrightSign (KIPICT2555). 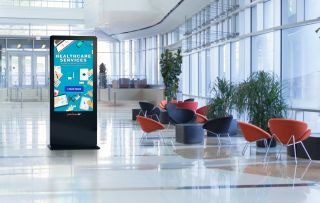 Featuring a sleek and stylish design with lean frames and a smaller footprint, the new and improved All-in-One Kiosk seamlessly creates a complete digital signage solution for any indoor application setting, according to the company. The What Else: The All-in-One Kiosk, powered by a BrightSign XT1144 Expanded I/O Player, is designed for a variety of settings, including hospitality, retail, corporate, transportation, entertainment, and education. The updated kiosk delivers Full HD 1080p60 single video decoding, HTML support, networked content playback, as well as an abundant set of features, including interactivity via the GPIO port, remote snapshot, live text, media feeds, and multi-zone. The Bottom Line: With an integrated 55-inch commercial LCD display offering 10 points of IR touch, the new All-in-One Kiosk fully engages users through a Wi-Fi enabled device, such as a tablet, computer, or phone. It can be see at DSE 2019 in Booth 2407.